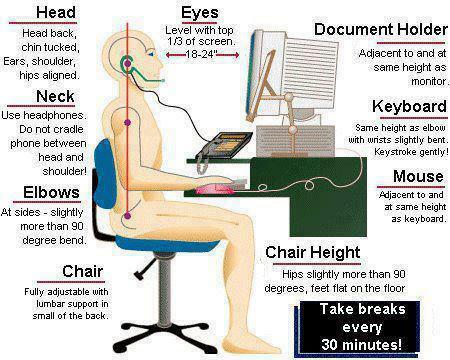 The term ergonomics is derived from the Greek words, 'ergon' which means 'work' and 'nomos' which means 'natural laws'. By the way if you are confused with the unheard name Ergonomics and what it is, here is the simple definition to understand it easily. It is the science of designing the job, equipment, and workplace to fit the worker and make humans interact with their work stations in a healthy way to maintain their physical health over a long period of time and enjoy life. The study of ergonomics is heavily engineered for ergonomics health safety. Proper ergonomic design and the proper way it must be used by the user is necessary to prevent repetitive strain injuries, which can develop over time and can lead to long-term disability. So for those friends who use computers heavily, make sure that you get the above ergonomics safety that is instructed in the above picture get implemented in your home and offices.